Delta State Governor, Senator Ifeanyi Okowa has ordered an investigation into the remote and immediate cause of the collapsed Water Tank behind the main bowl of the Stephen Keshi Stadium during the ongoing African Senior Athletics Championships holding in Asaba. 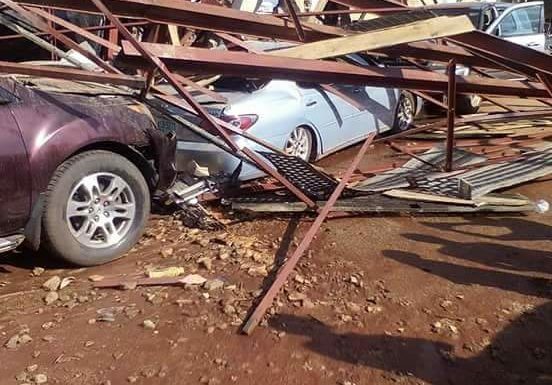 Blank NEWS Online checks revealed that a metal construction carrying the water tank collapsed, destroying some cars, a wing and section of the stadium fence while no life was lost. Governor Ifeanyi Okowa received approval from the Delta State House of Assembly for a loan request of N1.9billion to complete the stadium scheduled for completion in December 2017 but has allegedly gulped up much more undisclosed funds and lagged on till August, 2018 when the competition started. Alarmed by the incident which happened on Thursday, August 2, 2018, the second day of the African Senior Athletic Championship, many observers have blamed the collapse on the shoddy and hasty completion of the stadium, giving room for inadequate monitoring of construction materials to ascertain if they were substandard or not while others described it as a white elephant project. “We are expecting that the stadium should be ready by the end of June. I have also advised the contractors on what they need to do; what I need to do is to ensure that I am more regular in the project inspection. They are working hard but I believe that they need to work faster than they are doing now because there is a lot more to be done,” he said. Okowa who also inspected the project at the Asaba Airport, said that the ongoing work on the runway would be completed by the end of the month. He said that as soon as the airport runway was completed, the airport could be re-opened to flight. Many watchers have derided the state government and the Local Organizing Committee (LOC) for not adequately ensuring that everything is put in place before the commencement of the competition, explaining that during the opening ceremony, the Scoreboard had not been installed, making many people question how an Athletic meet could be held without a scoreboard. Others queried why an event of such magnitude is not broadcast live and non accreditation of most local journalists as is usually the case with internationally accredited sports meet. The final construction work at the stadium was allegedly handled by Governor Ifeanyi Okowa’s younger brother and Chairman of the Delta State Sports Commission, Tonobok Okowa, who was recently reportedly alleged to have assaulted the State Secretary to the State Government (SSG) Mr Festus Agas, while admonishing him for not handling matters pertaining to the hosting of the African Senior Athletic Championship expeditiously. But Tonobok Okowa has serially denied the allegations. Reports have it that many of the athletes from other African countries could not attend the opening ceremony of African Senior Athletic Championship, because they were stranded at the airport in Lagos due to lack of flight to Asaba. The Asaba airport which is alleged to be another elephant project by members of the Ibori dynasty is not functional for the major airlines to ply the route as only small aircrafts are taking the chance to land at the airport. In a statement made available to Blank NEWS Online on Thursday, August 2, 2018 by Charles Aniagwu, Chief Press Secretary to Governor Okowa,shortly after the collapse, he described the incident as regrettable but thanked God that no life was lost. God Okowa who expressed concern over the collapse of the water tank behind the Stephen Keshi Stadium Asaba, thanked God that no life was lost to the incident. The Governor has directed an immediate investigation into the cause of the collapse of the water tank with a view to unravel the circumstances surrounding the collapse. He also emphasised that discilplinary actions will be taken against anyone culpable in the collapse of the water tank if it is discovered that someone failed to do the right thing abinitio. The statement further assured that Government will take necessary steps to avert future occurrence. He called on the Athletes and the very enthusiastic spectators to continue to savory the beauty if the competition which so far has recorded appreciable success.